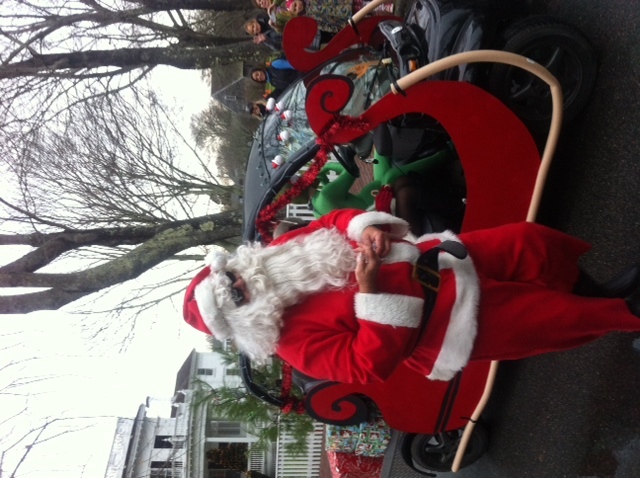 Christmas in Edgartown was lots of fun. The streets (well, Main Street and North Water!) were packed with so many people it would have done an August day proud. The parade was lead by a group of young girls dancing to “Jingle Bell Rock” and closed by, of course, Santa. Actually, there were two Santas – one on the fire truck, one in a Smart Car that had been tripped out with bright red “sleigh” sides. Not sure which Santa was the helper, but they both were great. I hope your holidays are wonderful – and here’s to the best New Year for all! 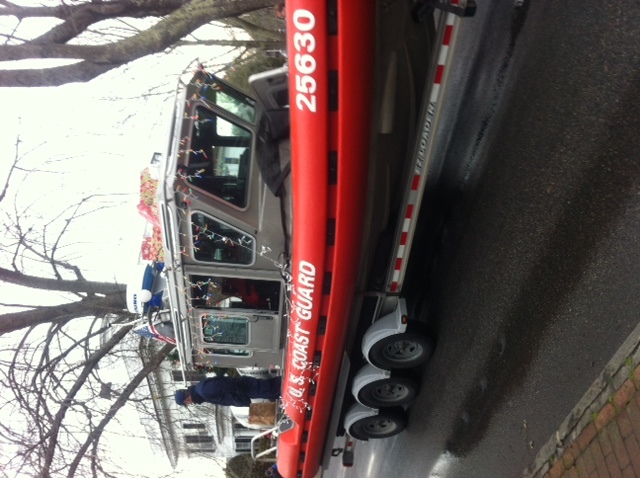 Even the Coast Guard had a float! 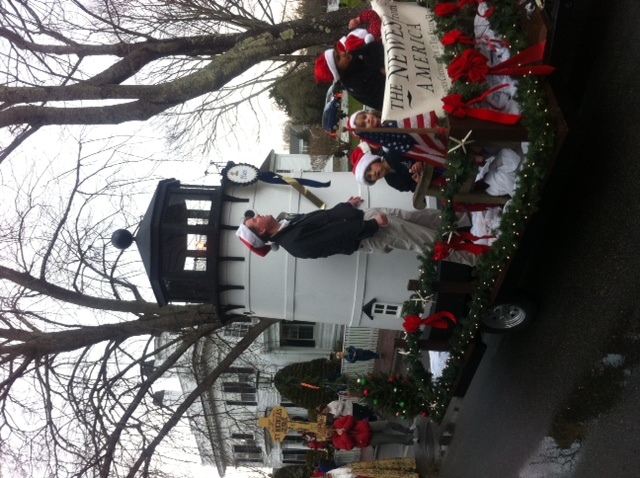 1st Place winner for the best float – Edgartown Lighthouse sponsored by my favorite pub, The Newes from America! The halls of the Town Hall were decked out, too! 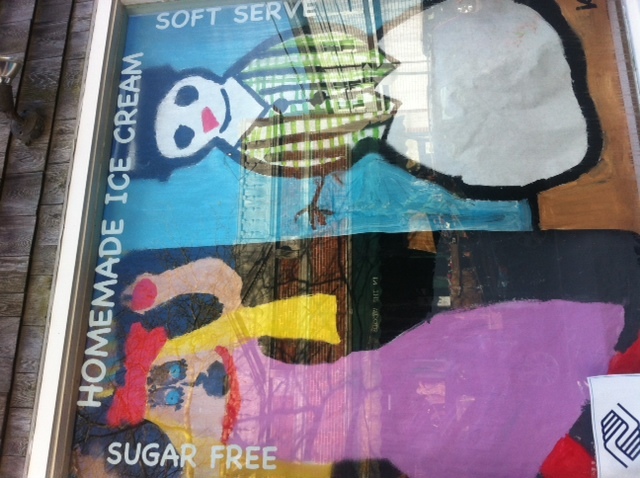 I love the windows of the shops that are closed for the winter! 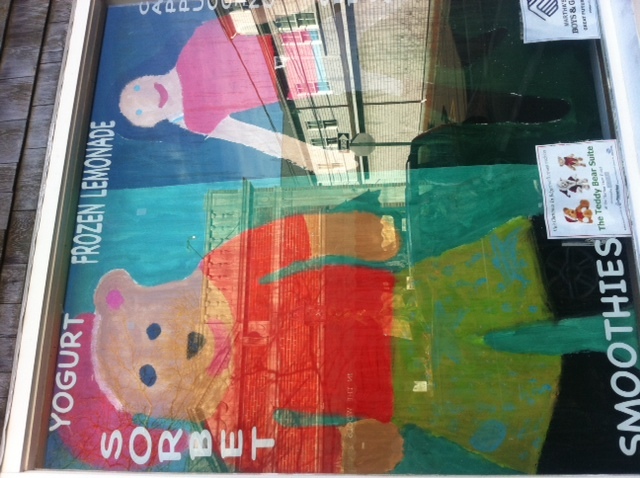 All over the island, instead of hollow eyes displaying somber racks and shelves stripped of their summer goodies, we get to see fun artwork created by – once again – the kids who live here. School kids, kids from programs at the “Y”, Boys and Girls Club kids, they all seem to get involved in keeping the island colorful and interesting throughout the bleaker months. Thanks, kids. The rest of us enjoy them! 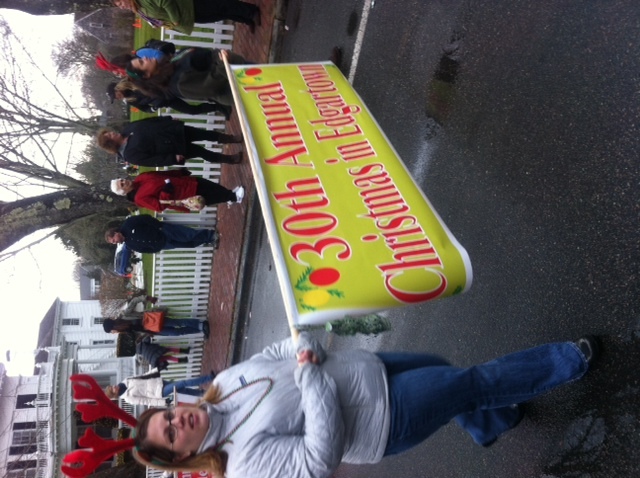 Oh, and by the way, tonight is the big night…Christmas in Edgartown begins! The lighthouse will be lit in its holiday finery; there will be carolers and wagon rides and hot chocolate and cookies everywhere. The island comes alive. And I am excited because I am going to have a few friends visit to enjoy the show! I have no idea who owns the boat or what it’s used for (clamming? scalloping? ), but I’ve noticed it anchored in the same spot in the pond that’s opposite Vineyard Sound on the beach road between Edgartown and Oak Bluffs. It’s been there several weeks now. To me, it epitomizes this place…it just sits there showing off its very natural beauty – a little tired, a little solitary, but comfortable and well-loved. I’m sure there is a story behind the little guy, like how many miles its oars have been paddled, and how many generations have learned how to fish by dangling a line or two off the side. I like to think a grandpa and his granddaughter (or, okay, his grandson) have shared nice memories afloat, threading creepy worms onto their hooks, catching a fish or two, unwrapping bologna sandwiches while passing a thermos of hot chocolate back and forth. 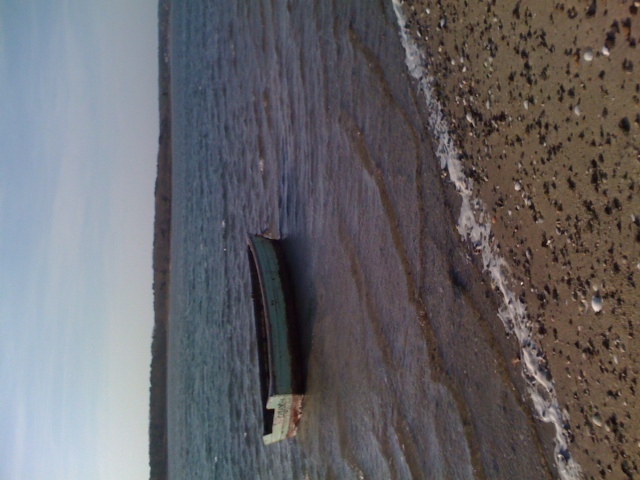 Maybe the little boat is sitting, waiting, now for the grandkids to come back to visit. They might not be here until spring, but something tells me this little boat will make it through the winter. Anyway, that’ the kind of stuff I like to think about on such an otherwise ugly day! 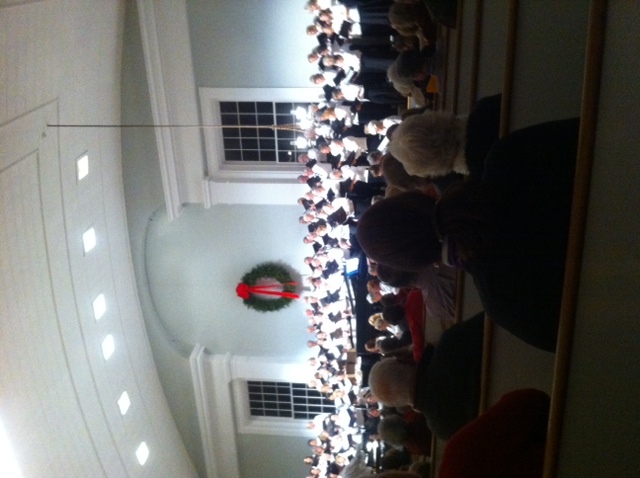 Confession: I wanted to go to the Island Community Chorus’ Holiday Concert Saturday night in order to hear the legendary acoustics inside the Old Whaling Church. Result: Holy moly. Not only are the acoustics wonderful, but so was the chorus! I was aware that, in order to be in the chorus all anyone needs to do is show up. No tense auditions. No nervous stomachs. No fear of being judged by others who surely will know they have a more beautiful voice than yours because, of course, they don’t hear you singing in the shower. As with most things on the Vineyard, this chorus is all about community. People coming together, neighbors having fun, working hard, all reaching for the best result possible with the hopes they can at least stay in the right key. Best of all, I did the math. 130 voices. About 200 packing the pews. Add to that 2 of my friends who I knew had been unable to attend…and this tells me that at least 332 people will be on the island this winter. Who says this place is only for tourists? Breaking news. The big guy is arriving on Cape Cod today via Coast Guard Cutter. Don’t know how they handle it now, but years ago I recall that Santa boated into Falmouth Harbor, hopped into a red BMW convertible (top down), and trekked into town, tossing candy this way and that. It was great fun. Next weekend, he comes to the Vineyard. Not sure how he gets here from Falmouth (the 6:15 boat? The 7:30? Or does he arrive via Cape Air? ), but he’ll parade down Main Street in Edgartown to the harbor on Saturday morning to help celebrate the Christmas in Edgartown weekend. Can’t wait for that. The whole weekend of December 9-11 has events galore – concerts and crafts fairs and special demonstrations at galleries and in shops; hot chocolate and cookies and, no doubt, clam chowder dressed up in holiday finery. Not to mention amazing gift shopping, if you’ll excuse me sounding like a TV spot. 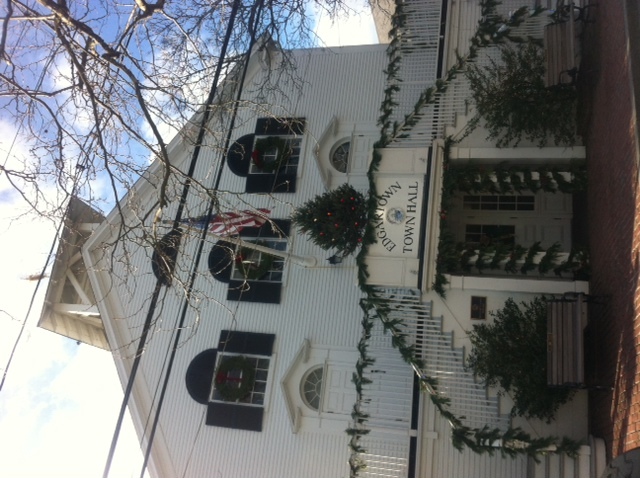 But more on Christmas in Edgartown later. 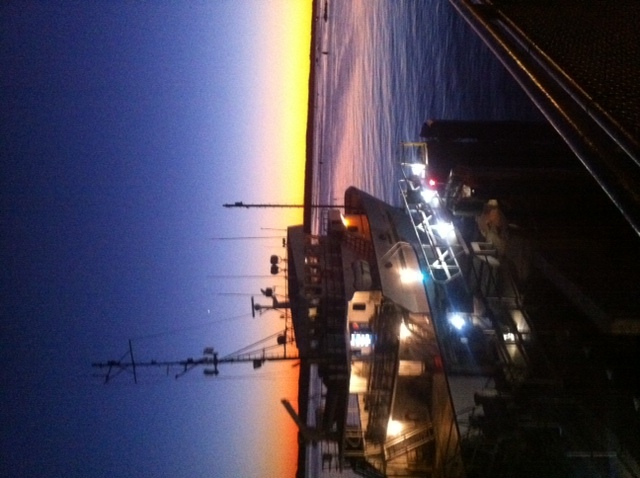 For now, please enjoy this shot of the freight boat, “Katama”, that I snapped last night at sunset when I headed back to the island from Woods Hole.